I typically don’t publish the readings for my “Bear-O-Meter” until and unless there is a change in level that would move the needle from the respective “sell, neutral, or buy” zones. However, by special request of a very long termed reader (“Daddyo”) I agreed to publish the most recent reading of the indicator. 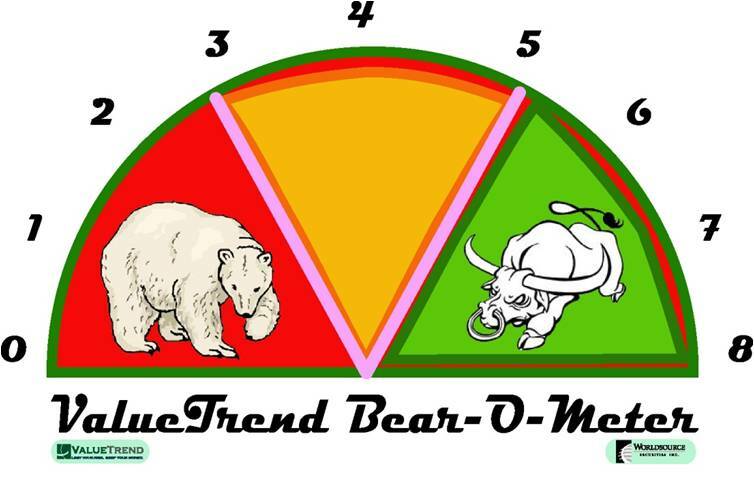 For new readers of this blog, the Bear-O-Meter is a forward looking risk indicator of the market. It is not a near-termed timing tool. Markets always have risk, and always have potential reward. This indicator simply weighs those two sides. A low reading indicates bearish potential, but it does not suggest selling the farm and hiding the cash under your mattress. A high suggests bullish conditions, but does not imply leveraging the farm to buy stocks. All levels are simply a probability reading. As such, a low reading can still lead into a market rally – and vice versa. Recently, the Bear-O-Meter moved from a level of “1” to a “2”. That’s still in the “bearish” zone, although it is improving. Bearish readings within the compilation include the “Smart/Dumb money” spread and a continued non-confirmation by INDU/TRAN. Seasonality does not return to positive until November, and other factors such as momentum, Put/Call ratio and some breadth indicators remain neutral. For example – note the neutral reading on the NHNL indicator below- I look for readings over 300 as overbought and below -200 as oversold. These factors carried over from last month. The compilation rose 1 point this month because of a bullish divergence between the Advance Decline line and the S&P 500, whereas last month’s reading showed no divergence (i.e. a neutral ) reading. Within the coming days or weeks, I expect that the current downdraft may push some momentum indicators into an oversold “buy” level and encourage the “smart” money to start buying. Seasonality will also allow a positive point to return to the indicator in November.